A photo of Robert Kronberger with the President of the United States. BORN: December 17, 1917, Boston, Mass. Annapolis High School, Annapolis, MD. February 2nd 1942 Participated in the Raid on the Gilbert and Marshall Islands Aboard USS Enterprise. May 1946 to November 1948 Occupation Forces of Europe aboard the Cruisers USS Wilkes-Barre, USS Dayton and Destroyer USS Glennon. 1954-1958 Served with the forces Defending the Island of Formosa and she Off Shore Islands of Matsu and Quemoy. 1966-1969 In Destroyer Tender USS Bryce Canyon, AD 36 Maintaining and Servicing Destroyers in Viet Namese Waters. Shipyard. December 1, 1970 Retired from U.S. Navy. Hughes Aircraft Co., Engineer Senior, Program Manager, Ship's Support Systems. Al Malaikah Shrine Temple, Past Outer Guard, Past Regional Mem. Dir. Robert S. Kronberger, Cornmander, born Dec. 17, 1917, Boston, MA. 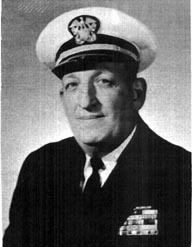 He joined the USN March 5, 1935, and served in the USS West Virginia and many others. Memorable Experiences: Pearl Harbor, Dec. 7, 1941 and April 18 raid on Tokyo. Retired Dec. 1, 1970. 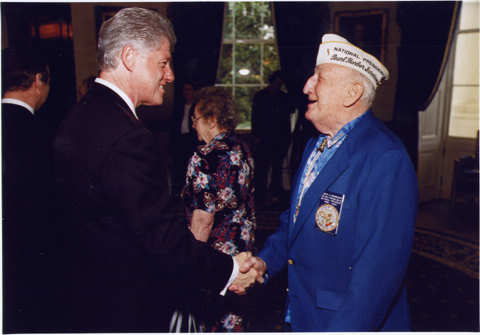 He received the Navy Commendation, Navy Achievement and all the other usual ones. He and his wife, Marion, live in Big Bear City, CA. They have two children and four grandchildren. Employed as project engineer, manager and program manager. Hobby is RVing, woodworking and fraternal organizations. Copyright ©2000-2019 USSWestVirginia.org. All rights reserved.